I urge you to take a very good look at this and withdraw your financial support from any activity that attacks a good group working hard for a better world. Please do what you can to stop funding this horrendous show. As Jews, we both know what it means to be persecuted for our religion, and we are the last people on earth who should do this to anyone. What I’ve learned about you leads me to believe that you’re a man of integrity and conscience, likely to give sincere evaluation to an important issue. My letter is regarding an urgent matter concerning the Intellectual Property Corporation (IPC) that affects thousands of good Americans and many others worldwide. First, I’d like to give you some personal background. I was raised in Philadelphia to what you’d call a “mixed” Jewish family (half Ashkenazi, half Sephardic). I went to Hebrew school, was bar mitzvahed and I’d even many years ago been to Har Zion Synagogue. I grew up in the 60s and 70s fearful that I’d either fight and die in Vietnam, or maybe the world would be destroyed in a nuclear holocaust. As a teenager I found myself looking for more answers to life than I had found up to that point. I read the teachings of many—anything from Karl Marx to Ayn Rand, and even Siddhartha. It wasn’t until 1984, when I read the book Dianetics—that I found the answers I was looking for. Your history of philanthropy and support of Holocaust remembrance speaks volumes about who you are. I’ve personally experienced, starting at a young age, the bigotry and hate propagated against Jews. I had to learn how to fight at age five because gentile kids in my neighborhood persecuted me for my religion. We both know that the world is too small for this type of hatred. All of this relates to IPC. The corporation has supported, for profit, a show that has played upon the hatefulness and bigotry of many of those who would watch it. This show, featuring Leah Remini, is built out of lies aimed at vilifying a very peaceful and highly philanthropic group: Scientologists. As Jews, we must never forget the horrors of the past, but, as a Scientologist (who retains his Jewish roots), I’m actually doing something about it, as are many Scientologists. 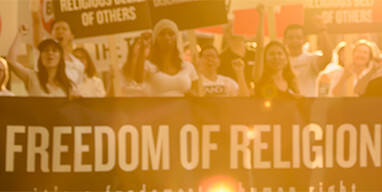 Jews and Scientologists are natural allies—with one of the aims of Scientology being to fight for the rights of all religions. Our real battle is with the ultimate enemy of mankind that comes from within—what we refer to as the reactive mind. Scientologists worldwide are engaged in mega campaigns to fight atrocities occurring daily on our planet. We do so with our dollars and our time. We are growing rapidly in numbers because we represent the values of every good man and woman on the planet. We educate millions worldwide with our Drug-Free World campaign; we fight to have 195 nations keep their promises for human rights through United for Human Rights and Youth for Human Rights; we provide a no-nonsense secular treatise on morality “The Way to Happiness” to millions; we alert the citizens of the world of numerous psychiatric abuses against our children, elderly and servicemen resulting in far too many harmful prescriptions and suicides via the Citizens Commission on Human Rights. But David, these are just the tip of the Iceberg. Scientologists are intimately involved everyday in trying to right what is wrong with the world. Our movement includes citizens from every continent who speak every major language. Moreover, Scientology offers a body of work that, if applied by a large portion of the world’s population, would prove to be the antidote to so much hate, crime, war and degradation. Like you, I’m a businessman. I’ve started several successful companies in California and Utah, most of them in the payments processing industry. And, like you, I want to ensure that when I make an investment—including one of a philanthropic nature—that the capital is going to be used wisely. I’ve personally donated large sums to various Scientology endeavors for the same reasons, I’m sure, that you have remained so connected to Holocaust remembrance—that being the answer to the question: what kind of a world do we want to leave for our children? Studying a little bit of your history, I believe that you are a man of high ethical and moral conduct. On the other hand, IPC, which you’ve invested in, backs the aforementioned show with Remini, a show which attacks with falsehoods and bigotry—and for her personal profit—a very important planet-wide movement and group of people. I don’t believe you’ve personally really looked at this because, if you had, I don’t envision you as the type of man that would allow this. If you understood what Scientology represents for mankind, you would know that Scientologists are not only excellent friends to Jews everywhere, but to all good people that want a better life and a safer planet. We fight against the very essence of what caused the devastation and horrors the world experienced in the Holocaust. I urge you to take a very good look at this and withdraw your financial support from any activity that attacks a good group working hard for a better world. Please do what you can to stop funding this horrendous show. As Jews, we both know what it means to be persecuted for our religion, and we are the last people on earth who should do this to anyone for the sake of profit—or for any reason. History has shown us that one of the greatest evils is having the power to do good and doing nothing with it.